Leftist billionaire George Soros funneled nearly $1 million to a Democratic district attorney candidate in Texas who went on to defeat an incumbent who opposed sanctuary cities. 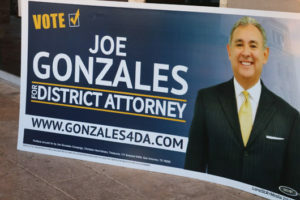 Soros-backed Joe Gonzales won the Democratic primary in the Bexar County DA race. Soros backed Joe Gonzales in the DA election for Bexar County, which includes the city of San Antonio. Gonzales defeated incumbent Nico LaHood in the Democratic primary on March 6. Through the Texas Justice & Public Safety super PAC, Soros pumped $958,000 into Gonzales’s campaign, according to campaign finance records reviewed by The Daily Caller News Foundation. In campaign ads, the super PAC accused LaHood of being racist. LaHood, who had made clear his opposition to sanctuary cities, accused Soros of trying to buy the election for Gonzales. If he wins in the November general election, which he is expected to, Gonzales would run the tally of Soros-backed progressives who have won district attorney’s seats since 2015 to at least 11. Soros’s “goal is to influence the nation’s criminal justice policies from the ground up by boosting progressive lawyers to victory in DA races around the country. It’s legal and appears to be working,” Peter Hasson noted in a March 6 report for The Daily Caller. Between 2015 and 2016, Soros helped fund 11 district attorneys’ races to the tune of $7 million, The Washington Times reported. The billionaire’s preferred candidate won in nine of the 11 races. In 2017, Soros spent almost $2 million on two DA races. His preferred candidate won both times. The Daily Caller noted that, this past November, Soros spent just under $1.7 million to help Philadelphia attorney Larry Krasner win his city’s DA. Krasner easily won in the general election. In his first few days on the job, Krasner fired 31 prosecutors. Soros is also funding third-party organizations such as the ACLU which are, in turn, targeting DA races this year. The ACLU is “planning voter education and outreach campaigns in district attorney races in California, Florida, Maine, Massachusetts, Minnesota, Oklahoma, Oregon, Vermont and possibly North Carolina and Missouri,” according to a McClatchy report.